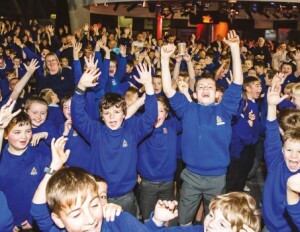 400 Junior Section members and 100 leaders from across Scotland spent the night in one of Glasgow’s most famous attractions on Friday 11th November. The Junior Section members spent the night at Glasgow Science Centre to experience the live science shows, learning to build their own rockets, creating clay fossils and exploring the stars in the centre’s very own state-of-the-art planetarium. This is the fourth time the event has taken place and the demand for places was incredible; over double the number available! In addition to exploring all the centre has to offer, Junior members enjoyed a story from BB Scotland Chaplain Rev Derek Hughes whilst devouring hot chocolate before it was time to ‘sleep’!